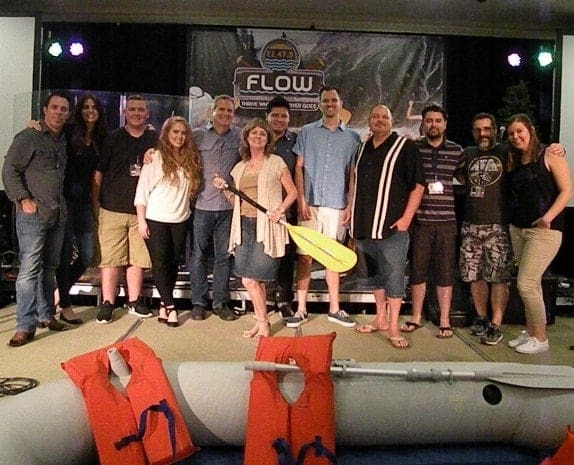 The 97th Annual Missionary Church Western Region Conference was held May 24-26, 2016 at the Indian Wells Resort in the Palm Springs area with our conference theme FLOW…THRIVE WHERE THE RIVER GOES based on Ez. 47:9. 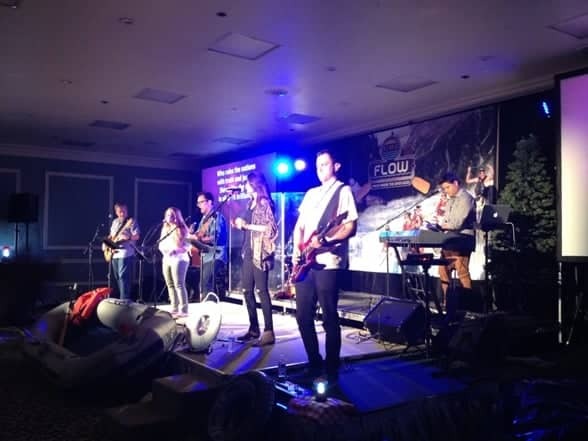 Opening and Introductions…Master of Ceremonies Pastor Chuckk Gerwig swept away with excitement, paddle and all…climbed aboard our river raft and led our FLOW river adventure for our Western Region pastors, churches, and ministries. Mike Livingston, Regional Director then opened the conference with prayer. Featured Husband and Wife Speakers included…Dr. Larry Walkemeyer:Lead Pastor of Light and Life Christian Fellowship in Long Beach, CA and Author & Speaker at Exponential and Dr. Deb Walkemeyer Licensed Marriage and Family Therapist, Fuller Graduate and Exponential Speaker. According to Ezekiel 47 wherever a river flows we see transformation of life. Flowers, shrubs, trees grow luxuriously and even turning salt water to fresh water as it flows into the Ocean. Are our lives characterized by the transforming power of the Holy Spirit or are they stagnant like a pond or lake with no outlet? Are our churches like a river or a lake? Are we just accumulating or adding in a way that produces the transformation needed for multiplication? Is our addition growth focus actually making cultural Christians and missing the target of multiplication and making Biblical disciples? Level 1 churches are characterized by subtraction and scarcity thinking. Level 2 churches are characterized by plateau, survival, and the tension between scarcity and growth. Level 3 churches are characterized by a strong addition-growth culture. Level 5 churches are characterized by multiplication, releasing and sending. Level 1 and 2 churches are characterized by scarcity thinking. Level 2, 3 and 4 are characterized by Growth thinking. Level 5 churches are characterized by movement thinking. Approximately 80%of U.S. Churches have plateaued or are declining, therefore only 20% are growing. It is estimated that less than 5% of U.S. churches will ever reproduce in their lifetime. For more inspirational insights from our speakers… (Download the three PDF HANDOUTS) distributed at each speaking session. 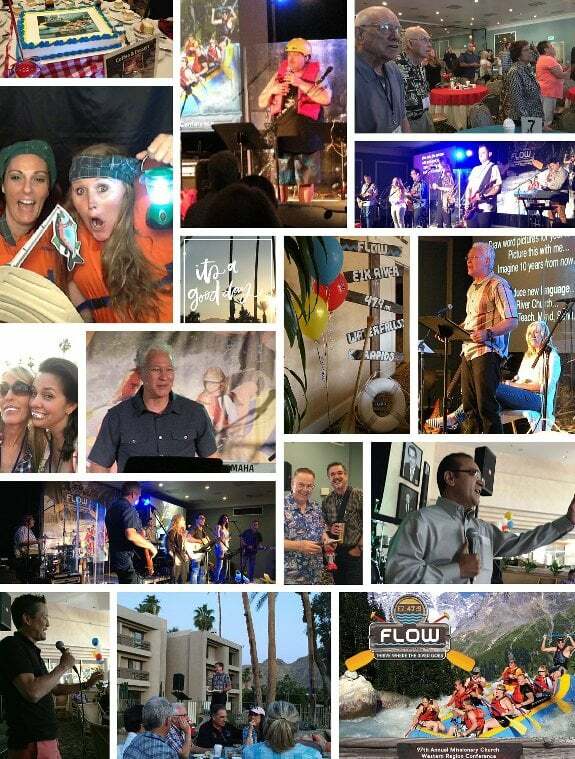 Along with Larry’s bookFLOW…Unleashing a River of Multiplication in Your Church, City, and World. Audio Sessions…Be sure to listen to all 4 sessions (MP3 audio) BELOW . Rounding out the conference presenters were Jim Firth, Senior Pastor at Hope Community Church and Worship Leader of the returning Worship Band. We enjoyed the same dynamic Worship Team this year featuring: Lead Vocals & Guitar- Kenzie Mae, Vocals & Guitar (Kenzie Mae Music) – Jeff Foss(Worship Leader of The Journey Church, Camarillo), Electric Guitar – Gabe Hollis (Hope Community Church), Percussion – Brian Crites (The Journey Church), Keyboards, Guitar & Spanish Lead Vocals, Misael Garcia and Bass Guitar & Vocals- Jim Firth. Thank you to our coffee & dessert sponsor: World Partners. Regional Coordinator for Latin & Central America Nat Brown began by sharing a history of World Partners stating that they just celebrated 125 years of outreach to the world. It is the Missions arm of the Missionary Church. He also shared that the traditional way of doing missions in the past of just sending US missionaries has drastically changed. Instead the focus has been on rising up and training indigenous leadership, and that the focus for the last several years has been on discipleship, and the multiplication of movements. Just a few years ago World Partners missionaries were present in about 30 countries, now there is a presence in over 121 different countries, where discipleship is exponentially growing the church of Jesus Christ. Generis donated the Kindle Fire giveaway along with co-sponsoring the Tuesday Pre-Conference Session: Growing Your Church’s Generosity Factorwith CFW. Generosity Strategist Warren Schuh shared resources and proven strategies for churches to grow offerings and revenues through their donors. Global Training Network (GTN) donated two Amazon Gift Cards to two lucky winners during our On-Time Giveaways along with sponsor T-shirts! Thank you to GTN President Paul & Lisa Madson and Josh Kienzle for supporting our conference each year! Toby Lazo, Hispanic Ministries Director led a special session for our Hispanic churches and pastors. Pastor Toby shared the following: The Road Ahead…When you see the ark of the covenant of the Lord your God, and the Levitical priests carrying it, you are to move out from your positions and follow it. Then you will know which way to go, since you have never been this way before. Josh 3:3-4. Joshua prepared to walk through this uncertain path relying on a promise that God gave him…Joshua 1:5. I encouraged the Hispanic leaders who are struggling in their ministries to look at the life of Joshua and follow his example. Based on some of the passages from his book, I spoke to the leaders about four important principles that should guide our lives. 1) We must rely on the promises of God. Josh. 1:5b 2) We must walk according to my Word. Josh. 1:7 3) We must choose to live a life of holiness. Josh. 3:3 4) We must follow the guidance of the Spirit. Josh. 3:3. Pastor Edwin Recinos spoke about a trip that he and Mike Livingston took to Nicaragua. He encouraged the pastors to think about the poor and to engage in missions around the world. He also challenged the pastors to help financially to World Partners. Spanish Translation…Once again the conference was translated simultaneously into Spanish for our Hispanic Pastors and Churches. Thank you to Matias Gramajo (from Iglesia El Gigante es Jesucristo, Castaic CA) who donated his time and passion to our Spanish speaking attendees. Another big thank you to our Translation Headset Coordinator, Linda Hoover who greeted and kept track of all the equipment and checkout process. CFW International Stewardship Breakfast, over 80 participants attended Christian Foundation of the West’s Breakfast and got involved in table discussions answering the questions: What is your church’s vision for growing your Stewardship Ministry? What is working? What challenges do you face? Following the discussion, panelists: Mike Somers, Exec. Pastor of Crossroads Community Church, Camarillo CA, Sr. Pastor Ben Meyers and Board Elder/Treasurer Don Calhoun of Baycities Community Church, Lomita CA took the stage. CFW President Kathy Saigeon facilitated the panel conversation. CFW’s 2017 Grants Program and Awards Banquet will be held February 2, 2017. Visit at www.CFWest.com to donate or register. Mike then introduced new pastors and those newly credentialed since the last conference. Introduced also were Peer Cluster Facilitators, Mission District Directors and Regional Committees. He also reported that in the last 12 months: 8 new churches were added, 9 Pastors were interviewed for credentials, 2 new Mission Districts were formed, and 5 Pastor Breakfasts were held. 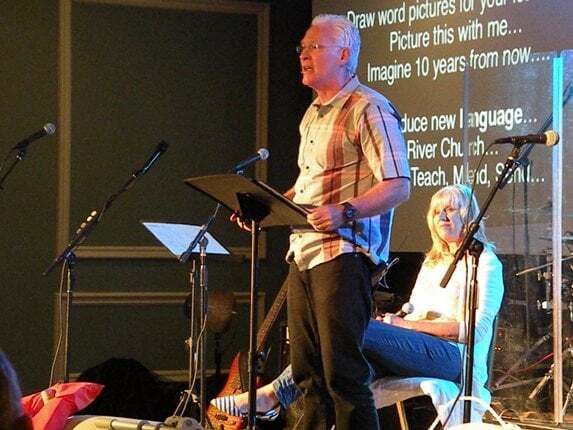 Church Multiplication Director, Dave DeVries, reported on the most recent church plants and disciplemaking networks being started in our region. The Missionary Church is committed to Jesus, the Bible and making disciples who make disciples. He stated that two new church plants have started or plan to start in the next few months…Redemption Church in Colorado and Limitless Church in Santa Clarita, CA. John Williams, Church Planter in Surprise, AZ also shared via video an update of his stomach cancer and new church service held at an elementary school. Emily Gaud, new Director of the Reverence Movement in Boulder, CO shared their new ministry to homeless women and children. Dave also introduced a new online Disciplemaking Training course that he is developing this year. A FREE download is offered for MCWR Conference Participants with “10 Habits of Disciplemakers.” Go to www.d-dv.us/mcwr2016for your free PDF. Prayer Warrior, Pastor Ben Jennings blessed our conference during the Morning Prayer Chapel as well as several times throughout each of the sessions. Many expressed thanks for his deep spiritual insights at 92 years young. Poolside Jamboree Video…thank you to Jim Firth for creating a festive video featuring all of our photogenic photo booth participants!